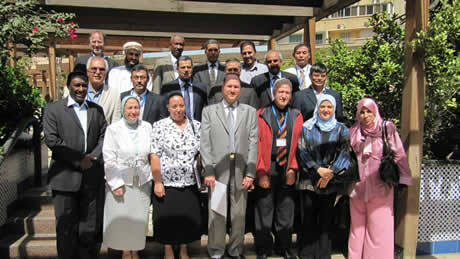 Participants in the G-WADI meeting and Flash Flood Risk Management Expert Group Workshop, Cairo 24-27 September 2010. Photo credit: Soroosh Sorooshian. the technical secretariat for its global network “Water and Development Information for Arid Lands,” or G-WADI. The program aims to strengthen global capacity to manage water resources in arid and semi-arid regions by building an effective global community. It integrates contributions from networks, organizations, individuals and UNESCO “category 2” centers such as ICIWaRM. The G-WADI network features knowledge bases and products such as near real-time global satellite estimates of precipitation (available at the G-WADI GeoServer hosted at the University of California, Irvine). Since its launching in 2003, G-WADI has effectively developed a strong Asian Network and is in the process of establishing additional networks in the Arab region, in Africa, and in the Latin America and Caribbean region. 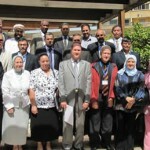 ICIWaRM participated in a September 2010 Cairo meeting to further discuss establishment of the Arab G-WADI Network. The meeting was co-sponsored by the Arab League Educational Cultural and Scientific Organization (ALECSO) and the Islamic Educational, Scientific and Cultural Organization (ISESCO). ICIWaRM will help IHP in networking, outreach, communications, training and capacity building, in addition to keeping track of G-WADI events, news and website.